Ready to jump at the first chance to get close to you, this adorable plush jackrabbit clip-on hooks easily to your keys, purse, belt loop, etc. This cute little jackrabbit stuffed animal backpack clip is sure to delight with its soft gray fur, white tummy, chin, and eye patches, huge floppy gray ears, and a sweet smiling face with warm brown eyes. 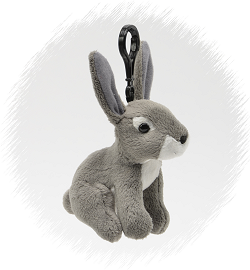 This jackrabbit plush clip-on is the perfect take-along pal and would love to accompany you on your adventures whether it is on your key ring, belt loop, backpack, purse, or even looped around your finger. Fun Facts about Jackrabbits: Did you know that adult jackrabbits can leap up to 10 feet at a time at speeds of 40 miles per hour? Whoosh!